Bulb EZ is a little known product, that solves a issue many of us have faced before; stubborn light bulbs that are hard-to-install and even harder to remove. These bulbs can often break or require great effort to remove when they burn out and need replaced... Introducing Bulb EZ! 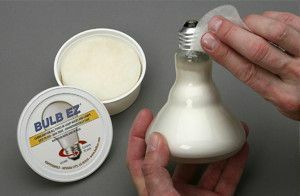 Bulb EZ is a silky, lightweight, non-toxic lubricant that ensures smooth install and removal of light bulbs. The lubricant prevents cross-threading and from lamps freezing in their sockets. You may use Bulb EZ on any type of bulb, but it is great for hard to reach area, elevated installs, and areas that are prone to humidity (such as kitchens, bathrooms, and outdoor lights). The lubricant is easy to apply. Simply wipe a small amount of Bulb EZ on the treads of the light bulb before install. That's it! Sold in a 1 ounce container that is resealable. A little bit goes a long way here, so this jar will be all that you most households need for several years. Available year-round in our light bulb section as well as at our Electrical service desk.